Later this year, Denver Public Works plans to stripe a buffered bike lane on East 47th Avenue between Brighton Boulevard and Clayton Street in Elyria and Swansea. The bike lane will be about a mile long and run through a mostly residential neighborhood that includes Swansea Elementary School and Valdez-Perry Library. A painted buffer will provide 1.5 feet of breathing room. 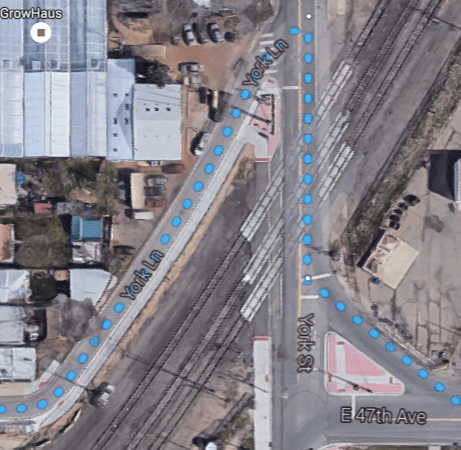 The 47th Avenue bike lane fits into Denver’s developing bike network. To the west it will connect to the Brighton Boulevard protected bike lanes currently in development, and to the east it will link up the planned bike lanes on Clayton and Steele streets. 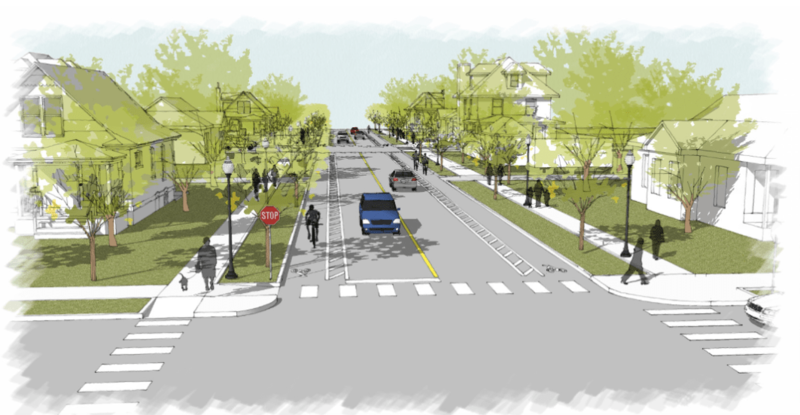 Residents identified the bike lane as a priority in the Elyria and Swansea Neighborhood Plan. Project manager Brittany Price spoke with neighbors at an open house in the neighborhood Wednesday and said some are worried about losing on-street parking. Currently the street has two general purpose lanes and on-street parking — removing the parking will make way for the bike lane. Planners are still figuring out the design where 47th is interrupted by train tracks, at the intersection with York Street. To reach the other side of the tracks, cyclists will have to jog onto York Street and York Lane, which is a one-way street for car traffic. Price said that planners and engineers have talked about a bike overpass, but it is unfunded. In the meantime Public Works will add signs and pavement markings to guide bicyclists in both directions through the irregular crossing. Always with the complaints about parking, yeesh. Does this mean that 47th Avenue, between Brighton and York actually get sidewalks? Most of the southside of the street has never had curbs or sidewalks. The northside only where there are businesses.